A very incomplete primer on what happens to Syrian Refugees who arrive in Europe. 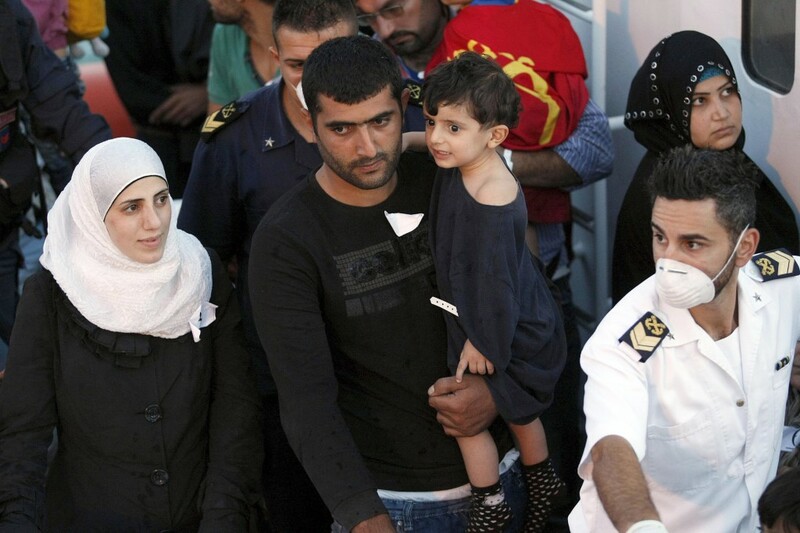 Syrian Refugees who survived a dangerous sea crossing face a new odyssey once in Europe – inhumane bureaucracy. 1) A refugee in Syria is a person who has left Syria. An Internally Displaced person suffers most of the same (and at times greater) risk to their lives, but they are not covered under the 1951 and 1967 protocols as “refugees”. http://www.unhcr.org/3b66c2aa10.html . The convention identifies not only STATUS but also RIGHTS of refugees, including their right to seek refuge and restrictions against them being held against their will inside a country where they fear their lives are endangered. 2) A refugee does not go through the same “immigration process” that is standard for a person who does not seek this status. This means that the refugee does not avail of protection by his own country (in this case Syria) and thus cannot seek the necessary documents from the Syrian government that are part of the “facilitation of travel” that are required under ordinary immigration protocols. They thus cannot apply for visas for work or study in the nations they seek refuge in, since this would require them to recognise Syria as able to protect them. Therefore, without an entrance visa, it is simply not possible to book a safe flight from Syria to European or North American countries, nor are there airlifts that facilitate the process in any way by the ONLY international organisation that has the obligation to oversee conventions regarding refugees (and see that they are implemented) the United Nations High Commissioner for Refugees. States that have signed the convention must adhere to the laws and if possible, assume the burden of granting asylum. 3) Why do all countries simply not grant asylum? Because the complying states are obligated to accord “favourable treatment”, that at the very least is “not less than that accorded to aliens generally in the same circumstances”. This is why in nations such as Italy, where the amount of favourable treatment accorded to aliens who are NOT refugees is minimal and at times repressive (including detainment in “identification camps” for unspecified amounts of time and the aliens are not automatically accorded that their families may join them after they have met specific requirements) Syrian refugees are seeking to request asylum in countries northern European countries that have consolidated programmes for aliens and refugees that guarantee more rights such as housing, work and integration into the local fabric. It stands to be mentioned however, that these countries are not on the Mediterranean and a Syrian can arrive there only upon having first crossed the border of a state that has that geographic continuity, by land or by sea. Given the impossibility of arriving directly to Sweden, Germany, Austria or the UK, given the impossibility of obtaining documents for facilitation of travel, the Syrian refugees have been forced to remain in refugee camps abroad (Jordan, Turkey) or in ad hoc and non-recognised refugee camps in places such as Lebanon. They have mostly sought private housing in Egypt, and a great number have continued towards Libya, where they have been under the belief that they would be able to safely arrive at the gates of Europe by sea and then would obtain asylum status in Sweden. 4) Article 6 of the charter is consistently violated in many countries of arrival of the asylum seekers. It is an article that grants them the right to freely move within the territory of their arrival. They find themselves in what can only be described as prison confinement, as they are under the jurisdiction of the national law, which in my country (Italy) is very restrictive of immigration, while at the same time being one of the European countries with the greatest number of arrivals of migrants and asylum seeks who have not legally obtained visas (granted under very strict economic conditions, often with the obligation of declaring economic independence and exhibiting proof of self-sustainment or “sponsorship” by a legal resident or citizen). This situation has made it impossible for them to move freely within Italy for the reason of arriving at a northern border and seeking asylum in a country that accords more favourable treatment. 5) The member states of the EU have signed something known as the Dublin II Regulation. It sets out the laws regarding granting of asylum. It was created to “prevent” that asylum seekers sought the best deals for themselves, putting excessive burdens on the states with more costly programmes, and this to maintain internal stability in these individual states. However, it has set as the regulation that the Responsible Member State is the state in which the asylum seeker first arrived, which is not Norway, Sweden or Germany, but Italy, Greece or Bulgaria. Since the Shengen Area has tightened its checks (and the minimum checks include checking for falsification and counterfeiting of travel documents and denial of entry upon that circumstance) many Syrian refugees, who had never obtained an authentic passport, and not having been issued a document in the arrival state as many had refused it (which would have required them to remain in holding camps), countries are “sending them back to Italy” under the Dublin II Regulation, and following considerable cost to the Syrians, they find themselves stateless, unprotected and impoverished in a foreign country. Their options are very slim. Many make several attempts to arrive to nations where they believe they will find better circumstances, and quite a few are left at the hands of unscrupulous persons who promise them passage, driving them to German-speaking areas of Italy and abandoning them, after having taken all their money and possessions. 6) In consideration of what happens upon arrival in Italy, as if it were not bad enough, getting here is an odyssey and risk. Average “passages” with traffickers have been quoted at rates that never are less than $2000 and in some cases, we have heard of passages costing $8000 per person. The second package included “passport and application for asylum in Sweden”. Many have died at sea. No one has had it go the way their hopes and dreams have been. Several persons that have been interviewed have said they wished to continue over and over until they succeeded, others said they would try to go back to the middle east where at least they understood the language and would attempt to rely on the charity of strangers. 7) We appeal for the regulations to be modified in light of the circumstances, but our appeals seem to fall upon deaf ears. We appeal for our countries to facilitate the asylum seekers and to provide humane living conditions for them so that they do not fall into the traps of those criminals who exploit them. In the meantime, we have to simply realistically inform those fleeing Syria of the situation here. We activists want to welcome them with open arms, with dignity and with generosity until they are able to return home. But, we are also very small voices in the matter, and our efforts in changing the laws so far have not been successful. The humanitarian emergency involves our countries and our human duty is to protect refugees. It is currently a task we are failing at, while the humanity of the volunteers almost always is exemplary.